People continued to arrive and a comrade that was still on his way, informed us that the next train from Cologne was also packed with people……. 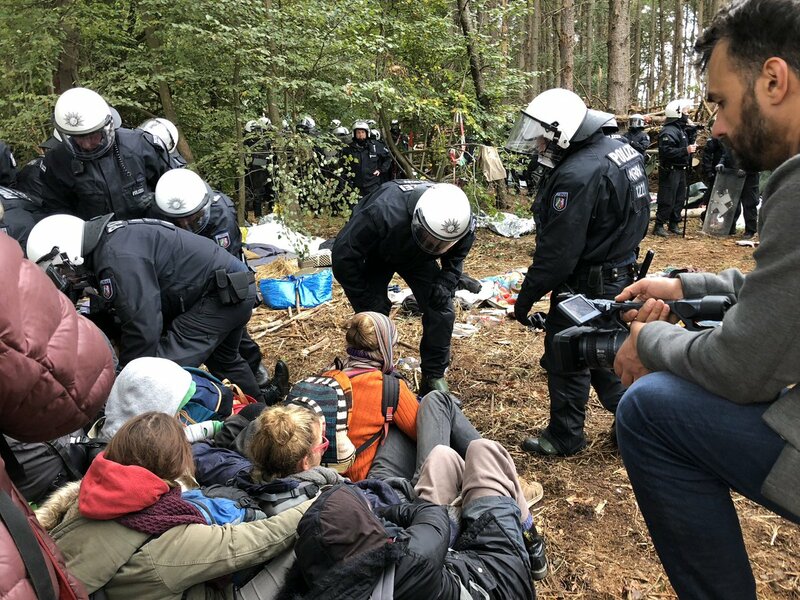 Hambacher Forest: Many cops evicted Paragraph 11 yesterday. Some arrests and evictions were very rough. Paragraph 11 was evicted but Black Socks, Ghost Town and Quality land are still standing. Ghost Town will be evicted today. Many cops evicted the ground structure of Paragraph 11 yesterday. Some arrests and evictions were very rough. Every time that we had the impression that journalists were not looking that closely, one or two cops stabbed people with their batons or pulled them by the ears. Some people were hidden under the underwood and were sawed out. That was not completely unproblematic and dangerous. Nobody was brought to the detention center. — Enough is Enough! (@enough14) 1. Oktober 2018………. On Oct. 1st eviction of Paragraph 11 took place, a tree house build by a Guild of Traveling Carpenters as a community space for those blocking RWE coal in Hambach Forest. It became a true community during Monday resistance against Fossil Fools forces of repression and destruction that have been ravaging and destroying all forest occupations, tree houses and cutting 100s of trees for last 3 weeks plus in what has been the biggest police operation in the history of North Rhine – Westphalia. With paragraph 11 being the last of over 30 tree houses destroyed in this 3rd of large waves of historic tree-top evictions in Hambi. First eviction took place in 2011 and at the time was the longest and most expensive in Federal Republic of Germany history(this time this record has been surpassed again) second occurred in 2014 with destruction of Monkey Town. With both previous waves of cops washing up on our green shores looking now like gentle breezes, however those actions were also complete clearing of all at the time tree houses in the forest. Those previous act of repression however only invigorated and amplified the resistance, multiplied exponentially the number of activists, ideas and treetop homes in the forest and generated public discussion of why such large resources in the time of economic austerity, ecological collapse and climate change are being spend to support and subsidize RWE’s toxic and climate killing opencast mining. Another dynamic that has also always been directly proportional to the level of repression has been solidarity which this time also became a weapon with hundreds coming to support, surround and fortify the surroundings of Paragraph11 beginning a week before and leading to the eviction, while thousands took part in demonstrations and actions world-wide to support the cause of saving and defending this unique and irreplaceable forest. Beginning on Thursday police presence increased in the area and Friday road was made to the occupation with hundreds coming on both days and blocking the surrounding roads reclaiming the area under P11 and finally on Saturday and Sunday building large, all around barricade walls with crawl space inside preventing the barricades being picked up of moved by heavy equipment. On Monday the CO2ps were massing in the thousands around the forest and started coming unto the road in front of P11 around 8:00 and came into the forest and surrounded paragraph11 an hour later. The walls all around were the height of 2 meters and formed a 3 layered spiral, and at first the police just maintained the kettle around the activists inside of a fortified village protecting the Tree and its tree house in center. Then CO2ps started working together with RWE contractors who cut the barricades with chainsaws, until getthting to the second layer of barricades that they begun to cut as well until finally responding to urgent calls that people were inside and proceeded to take them apart by hand, this had to take place before the operation could move further and cops showed their frustration by being aggressive towards those who were pulled from the inside. This frustration has almost become indicator that something was done right and someone did manage to get on their nerves. At that time on team of cops was loaded into a bucket of a bulldozer, while another team was breaking through the barricade on the others side with the help of RWE contractors. Before going in they were joined by additional police brigade. They came over the barricade in a raised bulldozer bucket sprayed those on top of barricade, who at the time were holding signs and trying to appeal to them, with pepper spray. Grabbing and pushing down the blockaders some of the cops fell down the barricade face first while taking some of the activists down with them. Aggressive destruction took place next with cops not only grabbing, hitting and pulling down all who were not already sitting down under the tree and even took their agression out on all the hanging tarps that were pulled down, ripped and cut and then on anything else such as any resisting pots, backpacks and jackets that got in their way which were kicked with great gusto………….. Although we usually don’t publish calls of NGO’s like Greenpeace Or BUND, we make an exemption for this demo, as it’s on the same day as the action of Ende Gelaende, October 6, 2018. The demo will be really big and creates headaches for the cops. Where to concentrate on? There are many tweets and Facebook event pages about travel options to Hambacher Forest on October 6. There will also be a bus from Amsterdam. Originally published by Busride to Hambi: Join the Protest! Facebook event page. Edited by Enough is Enough. 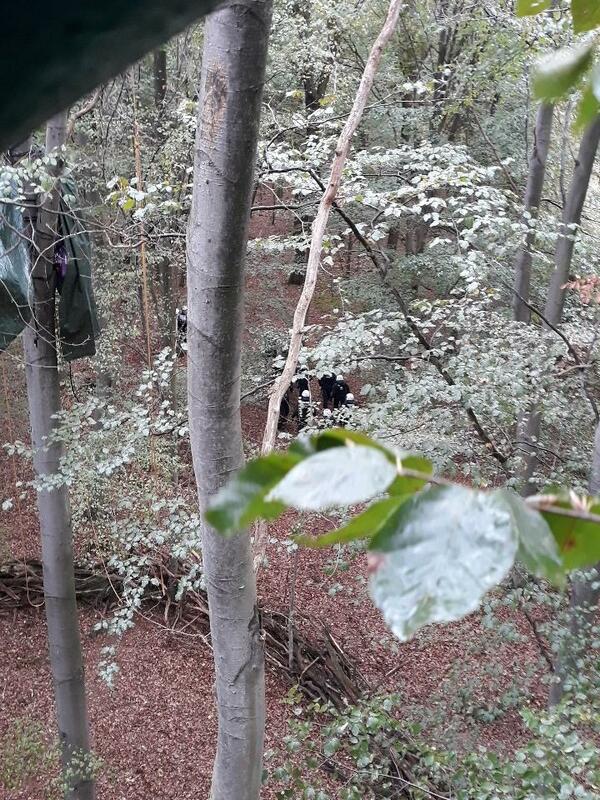 People have blockaded the further destruction of Hambacher forest for more than 6 years and have built over 60 treehouses to protect it from the expansion of the mine. Even though thousands of people have put their bodies on the line to end the coal extraction, and more than 750.000 people signed a petition against it, the German government and the company RWE continue their dirty business. Call-out for action on 6th October 2018, organized by #EndeGelaende-local groups at #HambacherForest by Ende Gelaende. 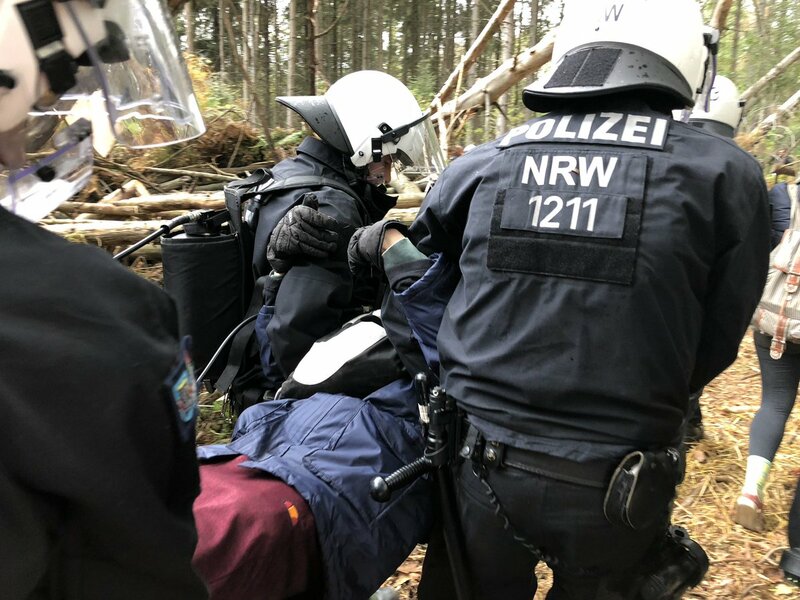 Over the last weeks, the police have supported the coal company, to clear the blockades and the tree houses to prepare the clearing of the forest for further expansion of their mining operations. 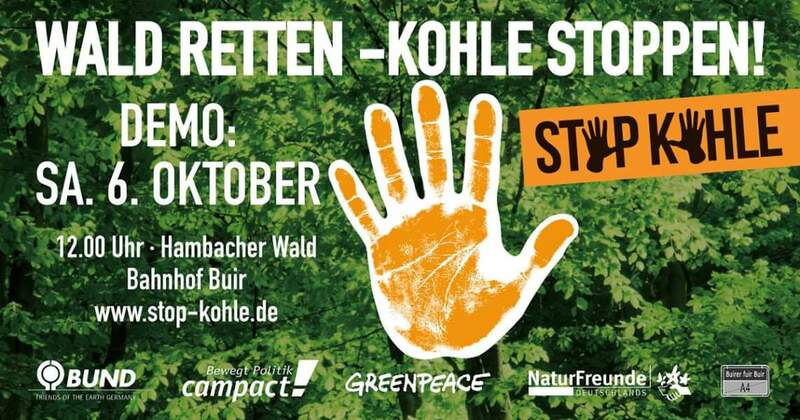 In order to raise the stakes, most of the German environmental NGOs agreed to have a mass demonstration together near Hambach on the 6th of October! On the 6th of October, we are arranging a free bus from Amsterdam to Hambi for people who want to join the mass protest on Europe’s key climate battleground! The protest is taking place in the Hambacher Forest on the edge of one of the biggest lignite mines and is aimed against the destruction of the forest to make way for the expansion of the mine and to celebrate the inevitable End of Coal! The bus will leave on the 6th of October at 07.30 @ Orlyplein, Amsterdam (the entrance of the train station Sloterdijk) and will return there the same day around 23.30. On the way we will make a stop at Station Oud Zuilen, Utrecht to pick up people that live in that area. Gathering Oud Zuilen 08.15, bus leaving 08.30. The first 40 people will get a seat. The rest will be informed whenever there is a free spot. Previous Previous post: They died for being poor: How Mass Squatting could Burst the Speculation Bubble.